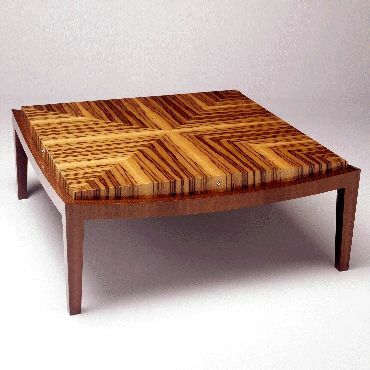 The Sfuzzi Table design originated as a rough sketch on a napkin in a restaurant bearing the same name. Convex stainless steel inlays provide a subtle finishing touch to all four sides. The top as shown in the photo is shown as a reverse diamond matched pattern. Woods typically used in the creation of this design are FSC certified as being derived from sustainable sources. This is verified by independent third party audits under Smartwood certificate #SW-COC-000055. All glues used are non-UF (urea formaldehyde) while the water based finish is low-VOC (volatile organic compound) and is doctor recommended even for those with chemical sensitivities. It is for these reasons that this design is Greenspec listed at my website. 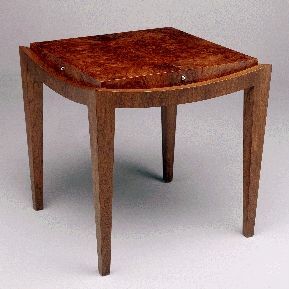 The specifications of the Sfuzzi Table are also consistent with the sustainability standards set out by the U.S. Green Building Council's stringent LEED (Leadership in Energy and Environmental Design) program, namely the MR-7 Credit for certified wood use; the EQ Credit 4.1 for Low Emitting Solvents and Materials; and the EQ Credit 4.2 for Low Emitting Materials, Paints and Coatings. By Wiggers Custom Furniture Ltd.